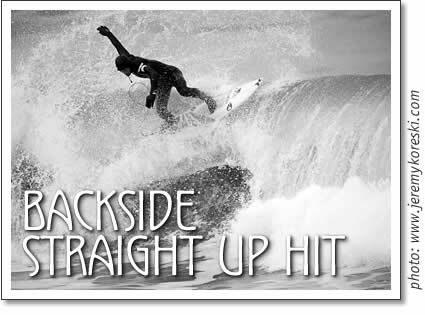 The backside straight up hit is a staple move for any surfers repertoire. If done correctly it will allow you to bash a section and carry speed down the line for your next move. Eye up the steepest part of the lip and start your bottom turn. Fully commit to it, and drive through it to gain momentum so you can go straight up. Your eyes should be focused on the lip you are about to hit, and you should have your shoulders rotated so your upper body is open to the lip. Rotating your shoulders will allow you to get as vertical as possible. Your knees should be bent with most of the pressure on your back foot. Proceed straight up the wave until the nose of your board is just over the lip. In this turn you can see that I had to push hard on my tail to get my nose over the breaking lip. You don't want your nose to go through the breaking lip so you might need to adjust your bottom turn for some sections. When about one third of your board is above the lip turn your leading shoulder down and back towards the beach. This will cause your lower body and your board to follow. You should be leaning over your front foot with a low centre of gravity while extending your back leg. The back leg extension will push your tail out the back of the wave, adding spray and style to the move. It may cause your tail to slide so stay low. Placing your front hand on your board will keep you low and stable. At this point you will be facing back down toward your landing place, and, as I did here, you may get stuck in the falling lip while you're re-entering the wave. Stay low and centred over your front foot and spot your landing while the wave pulls you back in. Once you feel your momentum going down the wave watch your nose so you don't nose dive. Absorb the landing with your knees and continue down the line. Commit to your bottom turn, and get your board straight up. Rotate your leading shoulder into the turn. Extend your back leg, place your front hand on your board and stay low. Watch your nose on the way down. Pete Devries grew up in Tofino and has been in surf competitions since he was 14. Tofino surfer Pete Devries explains the Backside Straight Up Hit maneouvre in this series of Surf Lesson Tips, published in the August 2009 issue of Tofino Time Magazine.